Cyberbullying often goes unnoticed by parents, teachers and even the victims themselves. In fact, The Hartford County Examiner reported that only one in ten teens tells a parent if they experience cyberbullying. Here are some of the reasons for under-reporting: 1. they are not clear they are the victim; 2. they think what has happened to them is normal; 3. they feel ashamed; 4. they feel they may be made fun of by family members. Whatever the reason for under-reporting, it is clear that cyberbullying has become a major issue. What Does it Mean to be Cyberbullied? Cyberbullying comes in many forms. Examples include an unkind or hurtful text message or email; using technology to spread rumors; sharing hurtful or threatening posts on social media and other online platforms; taking unflattering or demeaning photos and sharing them online etc.. The old saying “sticks and stones may break my bones but words will never hurt me” is simply not true. Words and other social media communication have great power. In the Hebrew Proverbs, it states: “Life and death are In the power of the tongue” (Proverbs 18:21). Today we might paraphrase and say “ Life and death are in the power of social media”. Cyberbullying can lead to anxiety, depression and in some cases even suicide. Research has shown that children and teens are especially susceptible to cyberbullying in terms of increased depression and anxiety. What is a healthy response to cyberbullying? Below are some best practices a cyber bully victim can use. Tell someone you trust. Just telling someone safe can relieve the sense of isolation such bullying brings with it. Find someone you know is respectful and understanding and who will keep your confidence. Report it to the proper authorities, and let them take action. If you’re on a social media site, you could report it. If you are at school, tell a teacher. If you are at work, involve your manager or the HR department. It is important to realize it takes a team effort to stop cyberbullying. By reporting it and letting the appropriate authorities take action, you are helping prevent others from becoming victims. There are social and legal steps that can be taken to stop this behavior. Educate yourself and get involved in bully prevention. If you are a cyberbully victim you have a voice that can inspire others to take action. 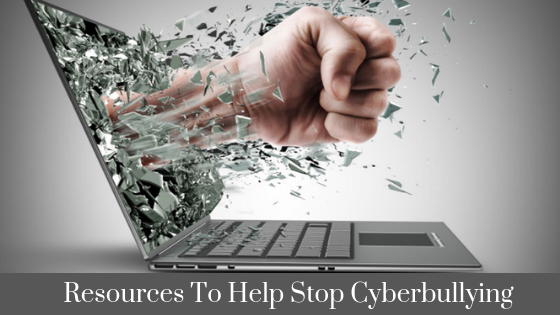 Use some of the resources below to learn more about cyberbullying and how you can get involved with bully prevention. This site has some great information on bullying and cyberbullying; tips for teachers and parents; as well as ways that you can get involved in bully prevention. This site is a “stop online harassment” project that aims to educate parents and teens. There are several articles and resources with the latest research. This website provides a list of laws about cyberbullying as well as fact sheets. It also has a section about how to report cyber bully incidents. This site offers an online safety podcast and several great guides for parents, educators and more. Here is a great article offering some great tips to stop bullying. This is a non-profit organization that is dedicated to ending bullying. They have ongoing campaigns you can join and a helpline to call for support. The page offers some a bullying FAQ that is very helpful. It lists signs and symptoms of victimization. This page shows state and federal policies surrounding bullying and also provides several helpful parent articles on the topic.